A man is being sought by police after an armed robbery at a post office. 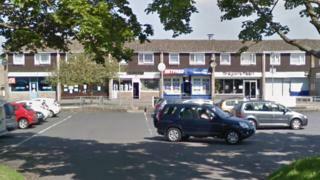 Police said two men wearing black balaclavas entered the post office in Burwell Drive in Witney, Oxfordshire, at 09:00 BST. They threatened staff armed with what were believed to be handguns, before taking an undisclosed quantity of cash. A 31-year-old man from Witney has been arrested on suspicion of robbery and police said searches were ongoing to locate another man. Thames Valley Police said a part from one of the weapons was dropped at the scene. The force described one of the robbers as a young man of slim to medium build wearing a black balaclava, black zip-up hooded top, black trainers and black jogging bottoms and black gloves. Officers said the other man is 5ft 10in tall and of slim to medium build - he was also wearing a black balaclava, khaki green/grey hooded top, grey jogging bottoms and black trainers with some blue markings. The force has not yet clarified which of the two men was still being sought. Det Insp Matthew Bick, said: "If you see anybody matching these descriptions, don't approach them, but contact 999. "We will continue to maintain a high visibility presence in the area while our investigation continues."